All the highlights of every game of the 1949 World Series are now available on a new 55-minute video from Rare Sportsfilms! Also on this tape is rare, never-before-seen bonus footage from our collection, including a look at players on the '49 St. Louis Cardinals who battled Brooklyn down to the last game of the season and lost the pennant by only one game. You'll get a special look at the '49 Yankees and see new shots of the 1949 World Series never before available on video. Finally, you'll see a Marty Glickman interview with one of the heroes of the '49 series, Tommy Henrich, whose homer broke up a 0-0 pitchers' duel in the bottom of the 9th of the series opener. Tommy talks about his career and makes candid remarks about opponents and teammates. 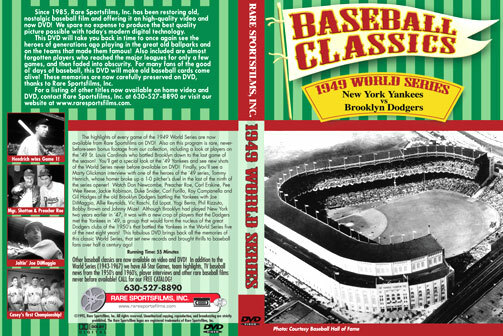 Included are clips from the 1941, 1947 and 1949 World Series. Game 1 at Yankee Stadium: Allie Reynolds vs Don Newcombe - Newcombe would pitch for the Dodgers for another 7 years, but in his rookie appearance he pitches his greatest series game, a 5-hit, 11 strikeout performance which is wrecked on one pitch - the third one he throws in the last of the 9th inning. Tommy Henrich becomes the Yank's hero with a blast into the RF stands that wins the game 1-0. Winner Reynolds is outstanding also, giving up only two hits to Brooklyn! Game 2 at Yankee Stadium: Preacher Roe vs Vic Raschi - For the only time in Series history, two 1-0 shutouts open a World Series, as Preacher Roe 6-hits the Yanks, and Gil Hodges drives in Jackie Robinson in the second inning for the only run of the game. Game 3 at Ebbets Field: Tommy Bryne vs Ralph Branca - The series continues to be a pitchers battle for eight innings of the third game with a 1-1 tie into the ninth (Pee Wee Reese's homer in the fourth inning accounts for the Dodger run). However, the Yanks chase Branca with three runs in the ninth, the big blow a pinch single by Johnny Mize with the bases loaded which scores two runs. Jerry Coleman's single off reliever Jack Banta scores the third run of the inning and the Yanks lead 4-1 in the last of the ninth. Ninth inning solo homers by Luis Olmo and Roy Campanella fall just short and the Yanks hang on to win 4-3. Game 4 at Ebbets Field: Ed Lopat vs Don Newcombe - With only 2 days rest, Newk starts game 4 for Brooklyn but lasts only until the fourth, when the Yanks score three runs, two on Cliff Mapes' double. An inning later, Bobby Brown's bases-loaded triple scores three more to give Lopat a nice 6-0 lead. But the Dodgers chase Lopat with a four-run inning of their own. Allie Reynolds relieves in the 6th, slamming the door the rest of the way and preserving a 6-4 Yank victory. Game 5 at Ebbets Field: Vic Raschi vs Rex Barney - The Yanks score in five of the first six innings, building up a 10-2 lead and coast to a 10-6 win. In the "Jimmy Powers" segment, you'll see a wonderful camera shot of Joe DiMaggio hitting his only homer of the series, a shot into the lower LF stands. Gil Hodges' three-run homer in the 7th helps, but it's too little too late and the Yanks win the World Championship! Afterward, you'll hear Tommy Hendrich's comments on his homer and what was said out on the mound after Hodges' 7th inning homer in the final game.